Another photo from our day in Newcastle. I spotted the pilot boat taking the pilot out to one of the ships. He steers the huge container and coal ships in and out through the heads, then the pilot boat picks him up again. Sometimes he is taken out to the ships by helicopter if the weather is rough. I think he must have forgotten something this day though because he set off out to a ship, then did a U turn and came back and off again a few minutes later. 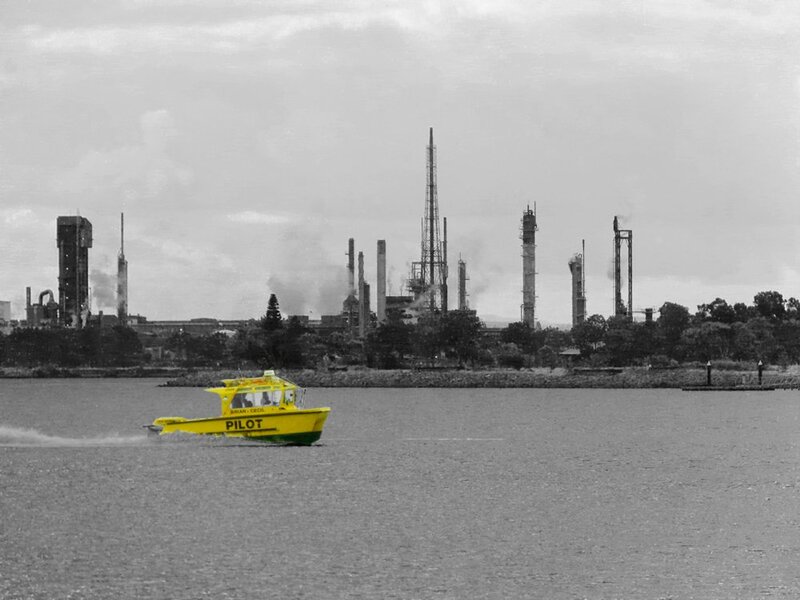 As it was such a grey day I decided to play about with selective colouring to highlight the boat. Great colour pop, well done. it certainly stands out like this! great shot! The selective colour is perfect for this shot. Great choice to go with the selective colour, it looks very nice. Lovely capture and S/C Babs. What a good idea and how cheery the pilot boat looks!! Great composition and really like the SC. Love your yellow boat......how that colour pops out! Great use of s/c Babs. Terrific use of SC Babs. Wonderful sc. The b/w really heightens the industrial feel of the background. Thanks for all your lovely comments and favs. It was a very grey day and the boat brightened it up a bit. I love the selective coloring. Great shot!